A Bird Hunter's Thoughts: The reason for the season. Or: Playing or Hunting, it's your choice. The reason for the season. Or: Playing or Hunting, it's your choice. 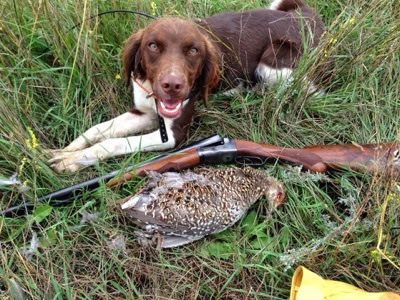 Years of planning and thought go into breeding for bird dogs. My small program has, so far, produced two puppies for me. One, Pearl (below), is a product of that work. Smallish, at 31# of solid muscle, she's a thinker, and, at times, exeedingly bold. 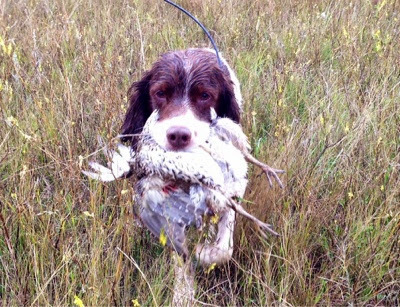 This is her first bird hunt and first exposure to anything but pen-raised quail. 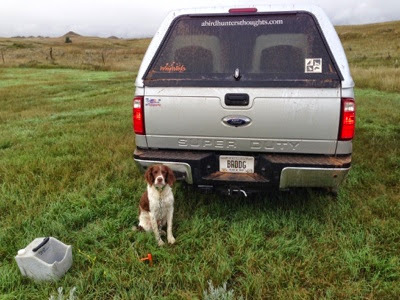 The first cast out of the truck, I teamed her with her mother, Ruby, a fast, big running girl, who's very solid and forgiving of mistakes in her bracemates. Pearl ran with Ruby for the first 30 minutes, at times out of sight, gaining some sense of how to hunt, where to look, what obstacles there were, etc. After a bit, she came back to me and started quartering 40-80 yards in front with an occasional cast to check out interesting stuff, just like we practiced at home. About an hour into the cast, she whipped her head up turned left and started moving slowly deeper into the alfalfa. Finally, she locked up, tail high, head high. "Whoa!" I said quietly. She took a few steps and locked again. She was about 50 yards away and I was moving quickly through the alfalfa to get to her, keeping an eye on her, one for the birds, and a third eye on where I was stepping (!). "Whoa, girl!" I chided. Another step.....4 Sharptail Grouse jumped up 20 yards in front of her. She froze, then stepped again, and another 5 Sharpies took to the air! She broke and off she went. "I'll get one for you, daddy!" She yelled over her shoulder. I didn't shoot. A few minutes later, a very fired-up Brittany puppy rolled up to me with lots of wonder in her eyes and a sense of purpose in her heart. It was 38 degrees, overcast and 10-20 mph wind from the north. It was a perfect day. We worked out of the alfalfa and in to the CRP grass, headed back to the truck. The boy in me wanted find those Sharpies and have another go at them. The tired legs said time for a break. It was another type of cover for Pearl, and she watched Ruby for a while before tackling it on her own. We moved along slowly, just enjoying the day. Suddenly, Pearl swapped ends and locked up, again! This time, Ruby was 10 yards behind her and back her point, as well. Thinking she might creep in again, I told her Whoa, but she didn't move a muscle. I came in from the front right at her (the best set up) and had the bird trapped and Pearl could see me the whole time. About 20 feet in front of Pearl, a single Sharp got up and I dropped it. Pearl was on it when it hit, and Ruby was right there, too! Jealousy took over and momma let Pearl take the bird. She picked it up and ran to me and put it in my hand! Right there, in a CRP field on the Montana prairie, we had us a little "love-in", as I grabbed her and told her how special she was, and how proud I was of her. True to form, she took it for about 10 seconds and looked at me and said, "There's more birds out here. Are we going to play or hunt?"